28-Feb-2016 -- This was a first attempt at geocaching, it was very close to the house and seemed interesting considering that it was a confluence (I was led to this site from the geocaching website). I walked into the woods through my backyard & began the short (just over 1 mile hike). I knew it was a swampy place from the post I had read & since it was a cold winters day I figured, I could have an easier hike since the ground was frozen, of course the ice made it a "watch your step" kind of trip. The area would of been the kind of place you would want high waterproof boots in the summer for sure, but with not much snow on the ground it was a decent hike with no wet feet, although the area had been cut so there were trees down & stumps every where. I should have got more pics, but this gps pic was all I got as the sun was not in or favor at the time. Coordinator's Note: This visit is classified incomplete because it does not meet the photo requirements of the project. 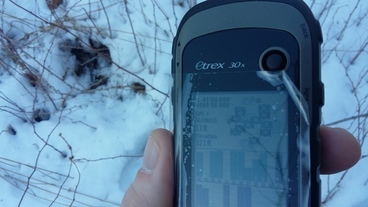 #1: My brand new gps on it's 1st trek, I had the glonass & waas/egnos features enabled.